Luxury Villa at Praia da Luz, a traditional seaside resort in the Western Algarve region of Portugal. 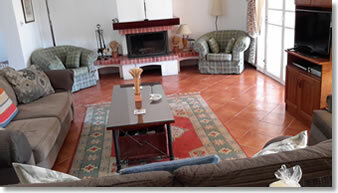 Large, spacious, beautifully furnished lounge / living room with fireplace, satellite TV and video. Air conditioned for your comfort on those hot summer days. Ideal for quality family time, or an intimate evening for two. 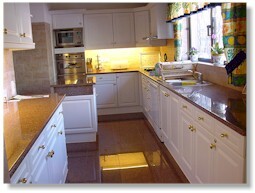 Fully fitted kitchen and utility room with large refrigerator / freezer, dishwaser, and washing machine. No need to dine out, unless you just want to sample the local cuizine. There is also daily maid service, and car rental is available. Four bedrooms and three bathrooms. All bedrooms open through French doors to the terrace and pool, with views of the sea. Third bedroom with twin beds. 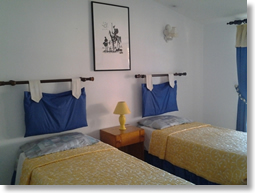 Fourth bedroom as a separate suite, with double bed and en suite bathroom. 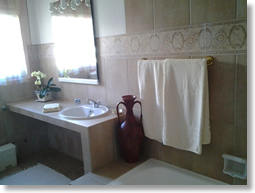 Full bathroom with separate shower unit. Leading from the lounge is a covered terrace, adjacent to the pool, which provides an ideal shaded area for dining outdoors, entertaining guests, or for general relaxation. 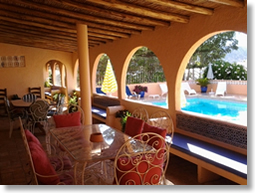 Heated swimming pool, surrounded by a large terrace with a built in covered barbecue area, and a jacuzzi / hot tub. After a long day golfing, walking, or sightseeing, a long soak in this oversize Jacuzzi is just the thing to relax and unwind before dinner. 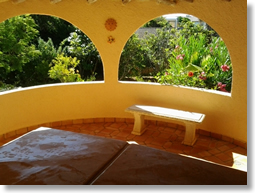 Property also includes a large and beautifully laid out garden with tropical plants and fruit trees. Perfect for relaxing with a quiet cup of tea. Separate from the main Villa is a lovely cottage which is a studio/apartment for two with a kitchen, modern bath and beautiful sea views. 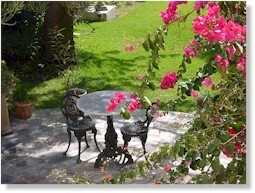 The cottage is available as a separate rental or in addition to the main villa. Master bedroom with en suite bathroom and queen size bed. Second bedroom with double beds. 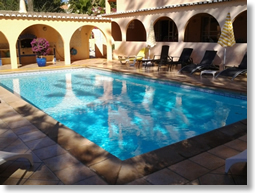 Take an Algarve holiday today at Casa Pedrinho! 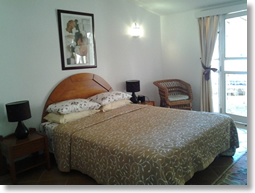 Luxury Townhouses at Praia da Luz, in the Western Algarve region of Southern Portugal.